Moving into your first place can be fun and stressful all at the same time. There are so many things to think about such as getting your utilities hooked up, finding good renter’s insurance, finding someone to help you move, and buying furniture and household items that you don’t already have. The furnishings in my first apartment consisted of a sofa bed that was passed down to me from my mother, my twin bed, and a TV that I had bought as a teenager. Oh, and one of those 1950 style kitchen tables with 6 chairs that looked like it belonged in a diner. It was actually quite valuable although I didn’t know that until it was too late. Sometimes a person needs more than a kitchen table and chairs in their first place so they may look at buying things on craigslist or Kijiji. But what if you don’t like what you find there? Here are a few other ideas of where you can look for nice furniture at a reasonable price. Have you ever driven through a residential neighbourhood and noticed a sign that says “Estate Sale Today”? You never really know what you will find at an estate sale but many times it is a great way to find very nice furniture (including antiques) for a very good price. If a person dies and leaves a lot of assets such as furniture behind, it is the estate executor’s responsibility to liquidate any assets that are not distributed through the will. This is typically done through an estate sale. When you attend an estate sale you may find that some of the furniture is out dated or too worn out, but at the same time you may find items that are in perfect condition and will fit perfectly in your new apartment. Estate sales are usually advertised in the classifieds section of your local newspaper. A moving sale is similar yet different to a garage sale. By that I mean that people are usually selling larger items, such as furniture and appliances, because they do not want to pay to move their furniture across the country. While a garage sale may include some furniture, it is usually small items that the person just doesn’t need any more like pictures, vases, kid’s toys, etc. The first time I decided to move across country I realized that it would cost a bundle to ship my furniture to my new location. I was okay with taking some small personal stuff like utensils, knickknacks, pictures and such, but since I was personally paying for the move I decided to have a moving sale for all the larger items. When it comes to price, you may pay a bit more for furniture at a moving sale versus a garage sale, but you will most likely find a better selection of furniture. 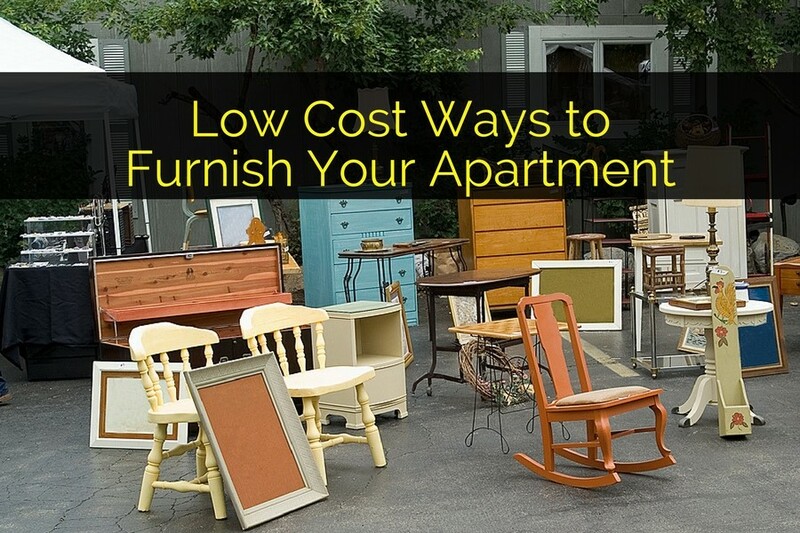 You will definitely save quite a bit of money if you compare it to buying brand new furniture. Have you ever walked through a show home and wondered what happens to all the lovely furniture once the home is sold? Personally I never really paid attention to it until one day several years ago when we were driving through our neighbourhood and we saw a sign saying “show home furniture sale this week”. The sale was being held at a community centre and it was a collection of all the furniture that several builders had purchased and used to furnish their show homes. The furniture is brand new, aside from a few people touching or sitting on it while they tour the home. Because they can’t return the furniture they sell it at a huge discount. The one thing about buying furniture at any of these different sales is that you need to find a way to get the furniture that you buy back to your apartment. That is where a good friend with a nice pick-up truck comes in handy. Offer to buy your buddy with a truck dinner, and maybe they will help you get some new furniture for your apartment.